Like most discussions of address resolution, the preceding sections all focus on unicast communication, where a datagram is sent from one source device to one destination device. Whether direct mapping or dynamic resolution is used for resolving a network layer address, it is a relatively simple matter to resolve addresses when there is only one intended recipient of the datagram. TCP/IP uses ARP for its dynamic resolution scheme, which is designed for unicast resolution only. However, the Internet Protocol also supports multicasting of datagrams, as I explain in the topics on IP multicasting and IP multicast addressing. In this situation, the datagram must be sent to multiple recipients, which complicates matters considerably. We need to establish a relationship of some sort between the IP multicast group address and the addresses of the devices at the data link layer. We could do this by converting the IP multicast datagram to individual unicast transmissions at the data link layer, each using ARP for resolution, but this would be horribly inefficient. When possible, IP makes use of the multicast addressing and delivery capabilities of the underlying network to deliver multicast datagrams on a physical network. Perhaps surprisingly, even though ARP employs dynamic resolution, multicast address resolution is done using a version of the direct mapping technique. By defining a mapping between IP multicast groups and data link layer multicast groups we enable physical devices to know when to pay attention to multicasted datagrams. The most commonly used multicast-capable data link addressing scheme is the IEEE 802 addressing system best known for it use in Ethernet networks. These data link layer addresses have 48 bits, arranged into two blocks of 24. The upper 24 bits are arranged into a block called the organizationally unique identifier (OUI), with different values assigned to individual organizations; the lower 24 bits are then used for specific devices. The Internet Assigned Number Authority (IANA) itself has an OUI that it uses for mapping multicast addresses to IEEE 802 addresses. This OUI is "01:00:5E". To form a mapping for Ethernet, 24 bits are used for this OUI and the 25th (of the 48) is always zero. This leaves 23 bits of the original 48 to encode the multicast address. To do the mapping, the lower-order 23 bits of the multicast address are used as the last 23 bits of the Ethernet address starting with "01:00:5E" for sending the multicast message. This process is illustrated in Figure 51. IP multicast addresses consist of the bit string 1110 followed by a 28-bit multicast group address. 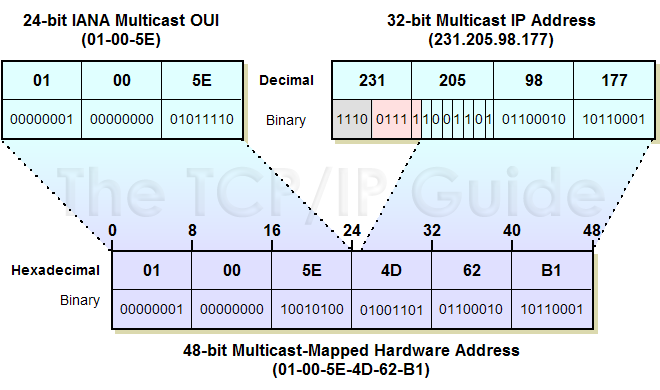 To create a 48-bit multicast IEEE 802 (Ethernet) address, the top 24 bits are filled in with the IANAs multicast OUI, 01-00-5E, the 25th bit is zero, and the bottom 23 bits of the multicast group are put into the bottom 23 bits of the MAC address. This leaves 5 bits (shown in pink) that are not mapped to the MAC address, meaning that 32 different IP addresses may have the same mapped multicast MAC address. Key Concept: IP multicast addresses are resolved to IEEE 802 (Ethernet) MAC addresses using a direct mapping technique that uses 23 of the 28 bits in the IP multicast group address.